Named after the Manabí people, the rural Province lines Ecuador’s coast and is renowned for its natural beauty and wildlife. Much of the coastline is protected as a national park and it boasts many clean and tranquil beaches. Golden sand leads down to crystal blue water with thick forests cladding the hills behind. The coastal stretch is also known for its avian occupants and only a short boat trip will take you to the famous Isla de la Plata, home of the Blue-Footed Booby! We’ve selected the best places to stay in the Manabí Province to make the most of this beach paradise. Whilst you’re in Manabi, be sure to visit Montecristi, and if the name sounds familiar, it should! The town is famous for its production of Panama hats and the high quality Montecristi Superfinos are named in its honour. But if it’s not hats you’re after, visit to enjoy the Museo Ciudad Alfaro, a great insight to Ecuadorian history with free guided tours. The weather in the Manabí Province is relatively stable year round and sticks in the mid-twenties. To avoid the rain, aim to visit between June and November. Playa de los Frailes is a protected beach that closes at 4pm. Go to bask on the picturesque beach and climb the leafy hills to catch a glimpse of a frigate! Take a two-hour boat trip to Isla de la Plata and dive to your heart's content! The area is part of the Machalilla National Park and is known as the ‘poor man’s Galapagos’ due to the great wildlife and the small bill! 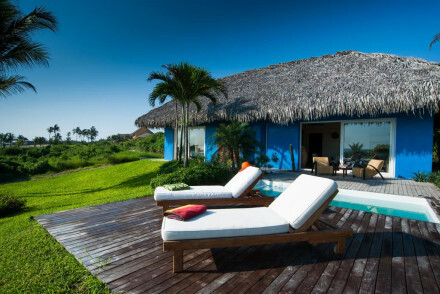 Tanusas Retreat and Spa is a fantastic ecologically friendly resort with contemporary design, topped with traditional thatch. A stone’s throw from the beach, a fantastic restaurant featuring local produce and, unsurprisingly, a great spa! The easiest way to reach Manabi province is to fly in to Manta airport (there are regular domestic services from Quito). Travelling throughout the province we recommend bus or taxi. The best time of year to visit is between June and November when the rainfall is lowest. Temperatures however remain fairly constant year round with highs in the mid twenties. If you wish to hire a car, we recommend you visit our online partner Rentalcars, for the widest selection. A colourful eco resort set in a tropical coastal location. Secluded suites mix contemporary style (think minimalist design and plenty of glass) along with more traditional materials. Dine on exceptional cuisine made using local produce. Be completely rejuvenated in the spa. The perfect beach escape. Total relaxation - An indulgent spa, tranquil villas and access to a stunning beach all combine to a totally rejuvinating stay. Foodies - Renowned chef Alain Ducasse runs the hotel and his creative cooking has been widely acclaimed. Surfing - Find good surfing on the hotel's beach. Classes are also available with a professionally trained teacher. Cooking classes - Learn to cook traditional Manabas dishes using vegetables from the garden and locally caught fish.